Yet another analyst has thrown their hat into the ring, joining others who have heard from sources in Apple's supply chain that the company is gearing up to debut a low-cost iPhone in the coming months..
Amit Daryanani of RBC Capital Markets issued a note to investors on Friday in which he said he's received word that Apple plans to launch "multiple new phones" in the June-July timeframe this year. Specifically, he expects Apple to launch a next-generation flagship handset, a so-called "iPhone 5S," as well as a more affordable handset. "The low-end iPhone will have the same 4-inch form factor as the iPhone 5, but will have a plastic casing and no Retina display," he said. "With a lower price point, AAPL will be able to target a growing and important part of the smartphone market (sub-$400 price band)." Daryanani believes Apple's rumored low-end iPhone will carry lower gross margins than the iPhone 5 or an iPhone 5S. But he also expects that such a product would contribute another $22 billion in revenue and more than $5 in earnings per share in calendar year 2014, which he believes would add $50 of value to Apple's stock price. 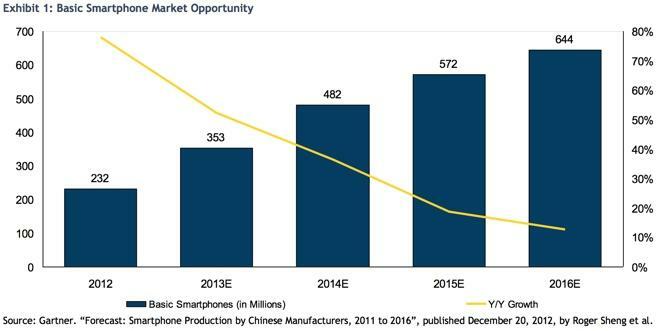 In his projections, the low-end smartphone market has a total addressable size of about 500 million units in calendar 2014. He believes Apple could capture more than 15 percent of that market in the medium term, leading to what he said is a "conservative" estimate of 70 million units. Daryanani also expects Apple to launch a new iPad mini and full-size iPad this year, while he said a full-fledged Apple television and so-called "iWatch" smart watch are "likely," but the timing of their debut is "unclear." RBC Capital Markets has retained its "outperform" rating for AAPL stock with a price target of $600.